I recently received some of the coolest temporary tattoos I've ever seen, created by none other than special FX makeup extraordinaire Christien Tinsley! Tinsley is the mastermind behind the characters' makeup on American Horror Story (one of my faves!) and a three time Emmy nominee for Outstanding Prosthetic Makeup. Tinsley was inspired by his work on American Horror Story and other series and movies to create special FX transfers that can be easily applied to create some ghastly gashes, brutish bruising and scary scars! I must say, when I received the "Gorywood" line of transfers I was immediately struck by how realistic they looked! Tinsley Transfers "Gorywood" Temporary Tattoos in "Intensive Care"
Tinsley Transfers "Gorywood" Temporary Tattoos in "Stapled and Stitched"
There are many more designs to choose from in the "Gorywood" line of Tinsley Transfers, just check out their site for more! 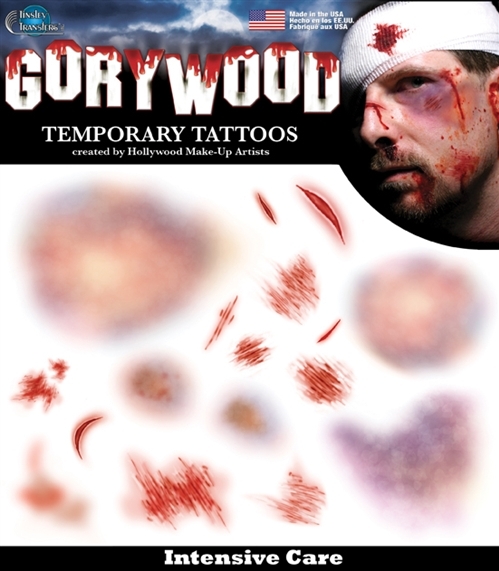 Along with the FX transfers, Tinsley has also designed temporary tattoo transfers that have graced countless stars in many films and series (including another one of my faves, Sons of Anarchy!). They have a multitude of designs to choose from on their site, but an upcoming line that I am excited about is their Goth line of temporary tattoos! I was sent a few of these transfers for review. Again, my first impression was the high quality of the transfers. These aren't your regular cheap temporary tattoos, but are beautifully designed and look like gorgeous creations from Tim Burton himself! I highly recommend checking out these high-quality transfers this Halloween season! 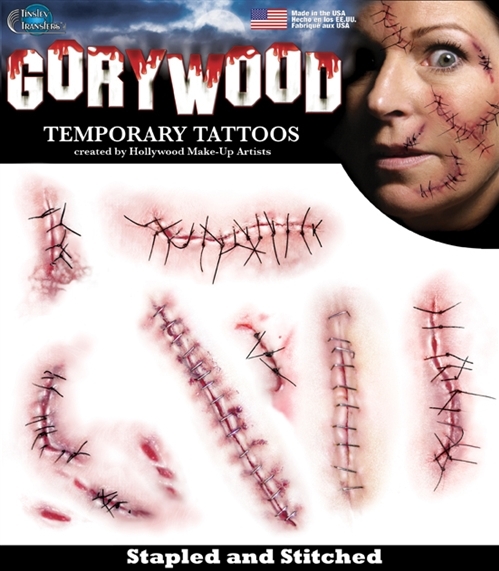 Tinsley Transfers has made fake gory wounds for costumes more easily attainable with their special FX transfers...no more messing with spirit gum or other tricky adhesives or prosthetics if you use the easy-to apply (and remove) Tinsley Transfers! Also, if you are looking for some realistic temporary tattoos to add authenticity to your costume, Tinsley Transfers has you covered with their massive selection of temporary tattoos. And keep an eye out for their gorgeous Goth line coming soon! Another awesome thing about Tinsley Transfers? Even though they are extremely high quality, they are very affordable! Most transfers won't set you back more than $5! For the amazing design and quality you get with these transfers, the price is a steal! For more info and purchasing info, visit Tinsley Transfers website!